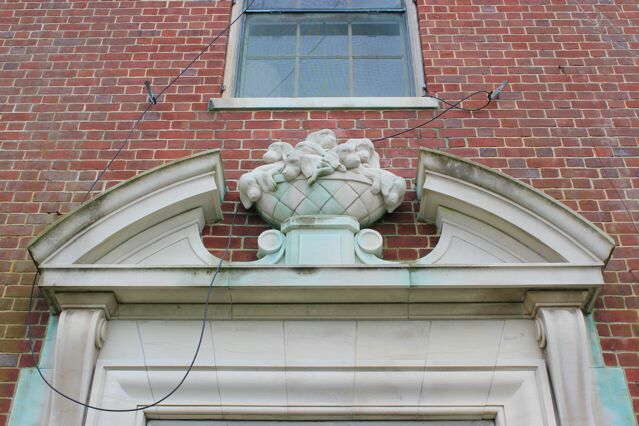 The rear entrance to 'Bogheid', the Helen Porter Pryibil estate designed by Delano & Aldrich c. 1938 in Glen Cove, with a basket of puppies motif in the broken pediment over the door. Click HERE and HERE for more on 'Bogheid'. Photos courtesy of Eddie Crowley. 'These photos were taken with expressed permission. 'Bogheid' is a private residence with no public access. I was hoping the puppies would make and appearance! in addition to her thing with mice,(she even had a chess set with rat figures)HPP also had a love for dogs -- in the auction catalog there were a zilliom Marguerite Kirmse prints listed. puppies in a basket, mirrored overdoors, iron railings & gates made to look like bull rushes, loads of champagne, and pink cigarettes, it all fits together so beautifully. I was hoping to see a close up of this detail how wonderful! My friend who is son of Mrs. Pryibil's God-daughter, inherited two pieces of furniture from his parents that they had purchased at the Pryibil auction- a leather upholstered porter's hall chair and a large mahogany partner's desk. Moving back to the City from Long island, they found the desk "surplus to requirements" and sent it off to Sotheby's to be auctioned. Much to their surprise, it turned out that it was an exceptionally important piece of furniture and brought a fortune at auction. Contemporary interior shots of Bogheid must have been published somewhere. Sadly, the auction catalog is not illustrated (with room views, at least). I hope some turn up. And i'm working on that wedding album which seems to have gone missing- I apparently opened a proverbial "can of worms" when I called my friend two days ago to ask to see it (again). He thought his brother had it, his brother thought he did. They're now focussed on a family storage locker. What catches my eye is the "whiteness" of the basin between the steps. Freshly cleaned or natural? Just appears to be a chunk of that very white marble, beloved of 19th c. tombstones, whose name eludes me at the moment. Magnus, when I was googling the Pryibil house hoping to find older pictures (by the time it was built, Architectural magazines were no longer in love with traditional Georgian houses), and found a number of auction listings for items with Pryibil provenance. Several fortunes were obviously made--a Georgian linen press recently sold for 120,000. It's clear that the Pryibil's had an eye for quality---the remaining bits of garden statuary are also far better than the usual. Speaking of quality, the longer I study these photos, the more I appreciate what amazing designers D&A were. Everything here appears plain and simple, masking what is actually a series of complex solutions to a complex program. And the refinement of thought that goes into what decoration there is---the Acanthus motif that appears on the iron work, the perfect turn of the stairs, the beautifully worked out designs for the door surrounds. Superb. I think "refined" is the perfect word for this house. And, BCD- am I dreaming this or were there shutters- exterior ones, with a motif of cattails on the ground floor shutters? Dare I ask what the black cable wire is? Are they communications related or securing something in place? I doubt the latter due to the amount of slack in them. It seems odd to have something so detracting upfront and obvious. 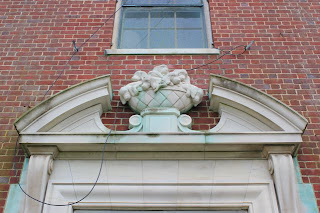 A larger concern with the wires, beyond aesthetics, is the drilling into the brickwork. I assume if the contractor who did that well-executed job was very caring in making sure water doesn't breach inside. Maybe a large 1980's era satellite dish in the forecourt would only be slightly more offensive over the wires. The floodlight mounts [if that's what they are] are worrisome for the same reason. Unless this is how the lady of the house acquired her beloved mouse collection. Unless I'm missing something, it appears that the wire is strung between the mounts of the now missing window shutters and the clips that are used to hold the shutters against the house (there is probably a technical term for all of this). 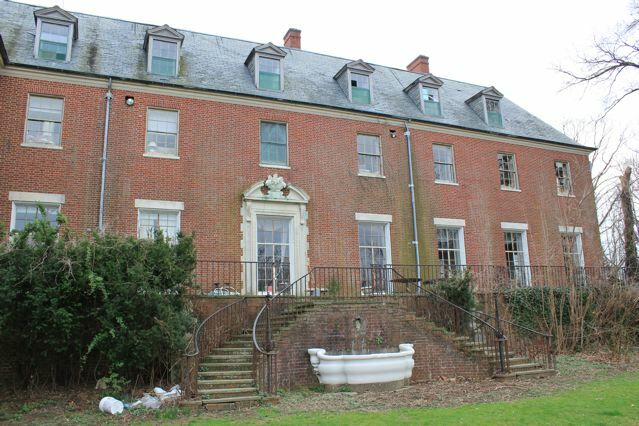 Not that drilling into the brickwork to install sloppy wiring would be the worst indignity that this wonderful house has suffered under its current ownership. I had noticed the wonderful shell over the front doors in the earlier post but had not noticed that the garden side had this marvelous basket of puppies. I cannot even consider that such architectural genius would have put mirrored insets into the segmental pediments of the drawing room overdoors, but I look forward to seeing the early interior photos that will surely turn up eventually. 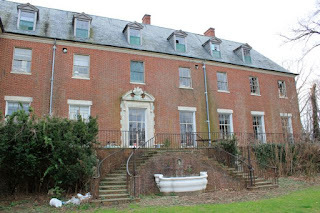 Slightly off topic - or not, I was wondering the other day about the current status of the Von Stade estate but couldn't remember the name until Kellsboro Jack's post today. The current Google view shows the sad truth - a rubble pile with 5-6 standing chimneys. Only a single wing of the stables survived demolition and sits amidst new roads and culdesacs. Hopefully, Bogheid doesn't meet the same fate. It certainly appears to be extremely well constructed as evidenced by the copper detailing around the door in today's pictures. 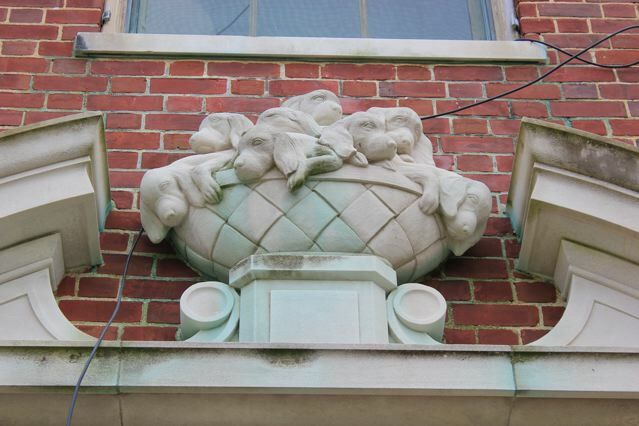 That basket of pups is one fine exhibit of craftsmanship in stone. I doubt if there are ten people on this earth currently who can produce that caliber of work. I don't understand why the son had to buy back the gnomes....wouldn't they have been his? I simply do not understand the appeal of D&A; their designs are uninspired and banal. A big brick country house nothing more. Some comments do not rise to the level of a response. Life is too short, and the answer is too obvious.